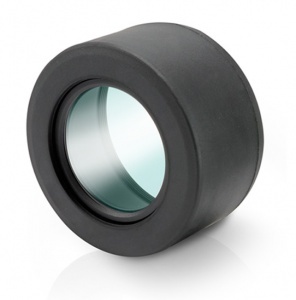 Eypiece cap with protection glass for Kowa TSN-880/770 spotting scopes. Compatible with current TE-11WZ (25-60x) eyepiece and also historical models TE-10Z (20-60x) and TE-17W (30x). At the opposite end of the spotting scope lies another area of vulnerability. The eyepiece, like the objective lens, is exposed to the full fury of mother nature. Including harsh weather and other degrading environmental conditions. The delicate coatings are at risk of being scratched by the elements as well as the user themselves for example spectacle wearers, persistent handling and insufficient storage or transportation. As with the objective lens, the eyepiece is pivotal for peak performance of your spotting scope, it is also an expensive part to replace. The Kowa TSN-CV88 is the perfect addition to a Kowa scope and part of the Kowa System protective accessory range. The TSN-CV series simply screw on to the eyepiece and replace the standard removable eye-relief cap. Ergonomic and comfortable viewing rubber encases a layer of see-through protection glass, forming a see-through protective barrier between the eyepiece optics and external elements. The CV-88 is fully compataible with all Kowa System accessories and digiscoping adapters.